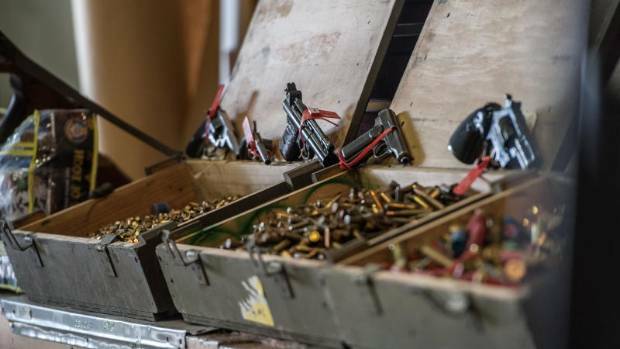 More than 57,000 illegal firearms including a rocket launcher and machine guns were handed in during a recent Australian amnesty in which gun owners could surrender such weapons without penalty. The government and some gun policy analysts were surprised by the large number of weapons that were surrendered in the first nationwide amnesty since 1996, when a lone gunman killed 35 people in Tasmania state and galvanised popular support for tough national gun controls. A virtual ban on private ownership of semi-automatic rifles and a government-funded gun buyback cut the size of Australia’s civilian arsenal by almost a third. 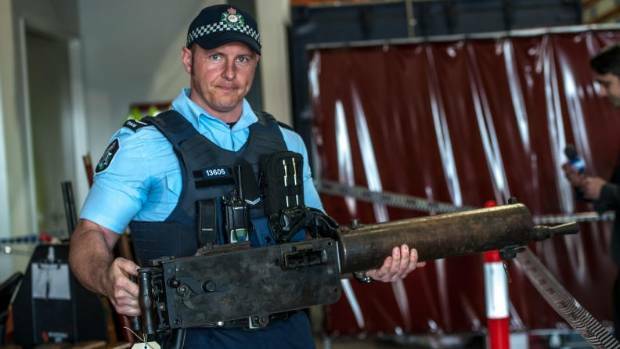 First constable Douglas Djurica with a WWI machine gun that was handed is as part of Australia’s National Firearms Amnesty. The government said Thursday the three-month amnesty that ended in September 2017 netted 57, 324 firearms, including almost 2,500 semi-automatic and fully-automatic guns – the rapid-fire categories particularly targeted after the 1996 Port Arthur massacre. “It was a very, very good result,” Law Enforcement Minister Angus Taylor said. 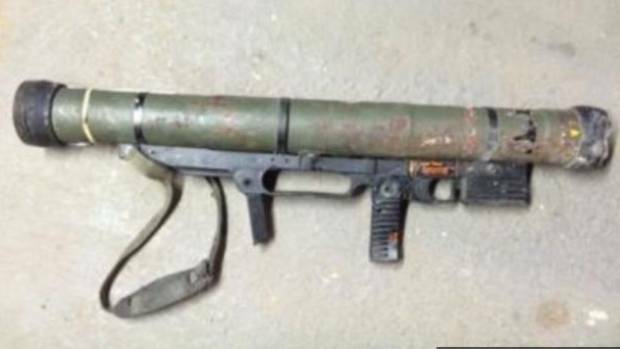 A rocket launcher was handed in as part of the amnesty in Australia. “This is another step in the process of making sure that we keep firearms out of the hands of criminals and gangs, and we keep Australians safe and secure,” he added. Taylor declined to comment on whether the United States and other countries should follow Australia’s example after the recent Florida high school shooting that killed 17 people. “I’m not going to give advice to other countries. This is working for us,” Taylor said, referring to national gun controls. Weapon and bullets handed in during Australia’s National Firearms Amnesty. Before the amnesty, Sydney University gun policy analyst Philip Alpers predicted it would only collect “rubbish guns” that were not valued by legitimate gun owners or criminals. “It’s a resounding success. I think it exceeded everybody’s expectations. I was astonished,” Alpers said on Thursday. Key to the success over several state-based amnesties that have occurred since the 1996 massacre was that licensed gun dealers had agreed to act as collection points. In previous amnesties, the guns have had to be surrendered at police stations. 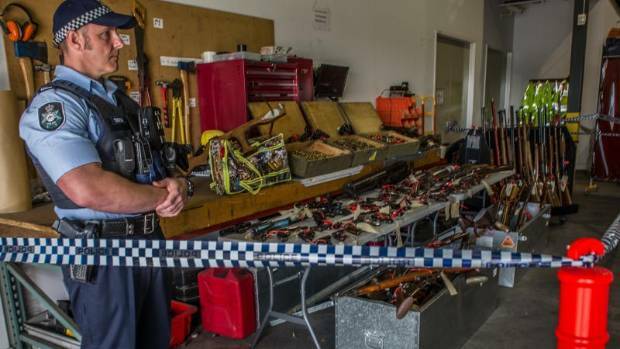 Australia’s National Firearms Amnesty haul in ACT. The amnesty report said a rocket launcher had been handed into a gun dealer rather than police. The dealer said he understood it had been found in a local garbage dump in Queensland state. Alpers said the surrender now of semi-automatic and automatic weapons that had been hidden in 1996 when they were banned suggested Australia’s mindset on guns was shifting and that controls had gained popularity over two decades. Most illegal guns in Australia are considered to be in the gray market, meaning they were not registered or surrendered as they should have been, but are not considered black market guns owned for the purpose of crime. The danger of those markets merging became obvious in 2014 when a man who professed support for the Islamic State group took hostages in a Sydney cafe armed with a gray market shotgun. The gunman and two hostages were killed in a shootout with police. A government inquiry into the siege recommended the government deal with illegal guns in the community.